This mid-term evaluation reports on progress achieved in PRI’s project in the South Caucasus on strengthening preventive monitoring mechanisms, which is funded by the Ministry of Foreign Affairs for the Netherlands. The project began in October 2016 and is being implemented over a period of 21 months. A summary of the mid-term evaluation has also been produced, which can be downloaded below. The evaluation took place after nine months, and assessed progress against the project’s three planned outcomes, which are: to strengthen the legal and normative framework for monitoring places where people are deprived of liberty; increase capacity of oversight bodies to monitor places of detention effectively; and to work with the media to increase awareness of the issue of torture, the importance of monitoring as a form of prevention, and to strengthen the visibility of the Armenian National Preventative Mechanism (NPM) and its work, through public awareness campaigns. The evaluation gives recommendations for the remainder of the project, which will also be useful for future PRI projects and for other organisations working on criminal justice reform. 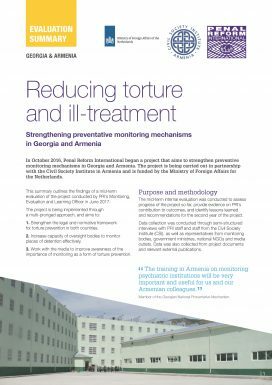 Assesses the legislative framework, conditions of detention and the development of monitoring mechanisms in Georgia, Armenia and Azerbaijan.